I'm not a big fan of RPGs in general like I used to be but a good action-RPG can still hook me. I've played the original Dark Souls a bit but couldn't really get interested in it enough to get very far. Bloodborne is a game that I have been following here and there since its announcement mainly because of the game's horror presentation and overall gothic world. Bloodborne is an action-RPG developed by From Software and published by Sony. The game plays very much like a Dark Souls game, but mixes up the overall gameplay from Dark Souls somewhat. 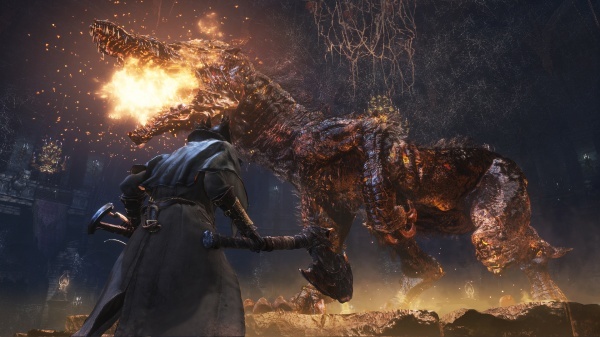 If you're familiar with Dark Souls, you'll feel right at home with Bloodborne. Bloodborne has the familiar setup as Dark Souls when it comes to gameplay, but the story and overall look of the game is much darker in mood. The game has candles that replace bonfires, Blood Echoes that replace souls and many other gameplay elements that mimic Dark Souls. Bloodborne is far from just a cardboard cutout of Dark Souls with different skins however. 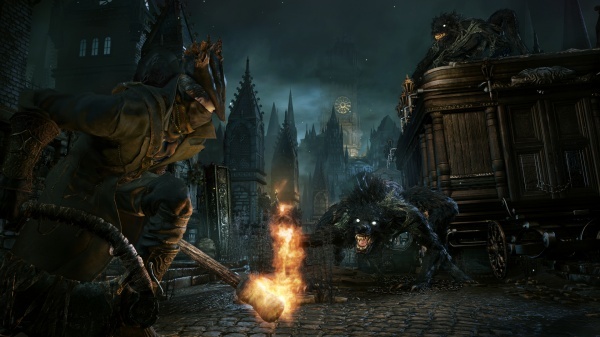 Bloodborne focuses more on gunplay in exchange for the magic found in Dark Souls. Bloodborne has arcane magic that is performed through the use of items but the game focuses more on firearms such as pistols, rifles, shotguns and other guns for its ranged combat. Bloodborne has parries that can be done with either your melee weapon or a firearm (gun parry). The parry stuns the enemy and opens them up for a visceral attack that takes off tons of damage. Learning to gun parry is actually a big part of Bloodborne's gameplay that will help a player out the most. Bloodborne is a very hard game. Enemies in the game would sometimes kill my character within about five seconds from being so aggressive. I died a bunch - a whole lot - but the game kept me coming back for more because I knew I could best the enemy that defeated me if I just used a different strategy or dodged the enemy's attacks better. The difficulty is basically just right throughout the whole game. It seems to have tougher bosses at the start of the game then it got easier once I got more adjusted to the combat. The combat in Bloodborne is very action-focused. The gameplay is fast and frantic. Just like in Dark Souls, you have to focus on dodging enemy attacks, but once you are attacked, you can regenerate some of your health thanks to the game's "regain system". Basically, the game encourages a player to stay aggressive by allowing the player to regain health if a damaged player attacks an enemy within a short time-frame before the health fully fades from their life bar. You have to be quick in returning the attack against an enemy however since the damaged health amount will drain fast, which leaves little room for dodging and no room for escaping. The game has a wide variety of melee weapons to use, ranging from axes and swords to spears and hammers. Each weapon can transform into an alternate variation of the weapon. For instance, the axe can be used as a normal hand axe or it can be extended with a pole to increase its distance. The hammer weapon can be used as a hammer or the handle of it can be pulled off to reveal a sword underneath the hammer. Moves can be mixed up so that your character attacks with both weapon variations in a single combo. One-handed weapons can be used along with a gun or other left-handed weapon. Guns range from pistols, rifles, shotguns, cannons and other types of firearms. Firearms often don't take off a lot of damage and are mainly your source for hitting an enemy long range to get the enemy's attention or stunning an enemy with a quick parry gunshot before an attack. Blood Echoes are your source of experience that you gain from killing enemies. Just like in Dark Souls, it can be lost upon death and recollected if you go back to the place where your character died and retrieve them. Blood Echoes can be used to boost stats and increase your overall character level inside the Hunter's Dream. The Hunter's Dream is the place that you can return to from any candle in order to power-up or buy items. 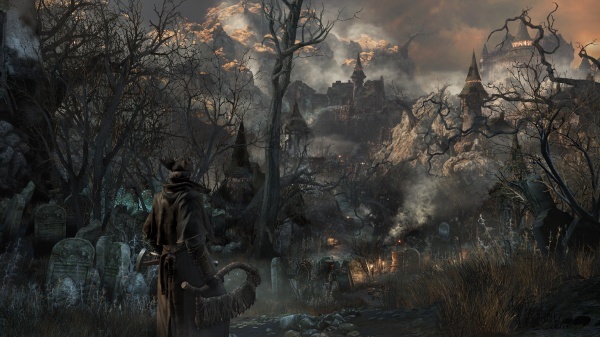 Bloodborne has a world and overall style that oozes atmosphere all the way throughout the game. The game's look reminds me of a Yoshitaka Amano inspired style such as a drawing from Vampire Hunter D, Final Fantasy 6 or many of Amano's other works. It's like every character in the game has this twisted side to them and the overall world looks like a sinister place to live. The overall graphical detail, sound, and enemy design in Bloodborne is absolutely fantastic when it comes to representing its gothic atmosphere. Everything works so well! The game actually managed to scare me a few times with a sudden jump scare or some of the enemy types. The enemy types in the game look like they were Lovecraft inspired. The main focus of most enemies is some sort of beast design such as man beasts or actual werewolves, but there are also some extremely surreal enemies such as a brain with tentacles for feet or a spider with a human head along with tons of other strange-looking enemies. The game doesn't repeat enemy designs that much at all - you're constantly running into new enemies per area. Bosses are all very unique as well. Besides offering a great challenge with tons of moves at their disposal, bosses have their own hideous look and unique style of attack. Some bosses will go all out with their attacks in order to stomp your character into the ground and some bosses take a different approach to attacking that feels more like a puzzle that you have to solve. The overall graphics for the game look absolutely beautiful, but I did have a problem with the overall framerate. The game seems to go for 30fps, but the framerate doesn't stay consistent. There were quite a few areas where the framerate would get jittery even when there wasn't a lot of action on the screen. The majority of the game runs smooth enough to enjoy greatly, but I can't help feeling that the game's framerate should stay more consistent, especially since it is an exclusive title. The game has very little loading while playing it, but once your character dies, you have to wait through a 40+ second load screen before restarting. It feels just like this long loading screen is your punishment for dying. It's been noted by the developers that the loading will be reduced in a later patch, but as it stands now, the loading screen after dying is very annoying. The game offers tons of replay value through its main campaign, optional dungeons, secret areas, and new game+ after you beat the game. The game also has multiple endings. You can ring a bell to call in other players for assistance and the game has a player vs player multiplayer mode where you can invade other player's games. While online you can view notes that other players have left for extra tips on upcoming areas. The game doesn't allow a player to spoil with a message - it's more like a cryptic message of things to come that are chosen from a few options when a player leaves behind a note. The game can be played fully offline as well if you don't care to see the tips or don't want to run the risk of your game getting invaded by an enemy player. If you have a PS4 you should definitely give Bloodborne a try. The game was super fun all the way through its 40+ hour campaign and I'll be playing it for quite a while longer to try to do just about everything. Even if you're like me and don't really care much for RPGs, you might still find something to like in its overall atmosphere and story. The story takes a backseat to the gameplay, but it's still quite intriguing. Horror fans will most likely find something to like with the game's overall look and action fans that enjoy DMC might enjoy the game for its atmosphere and fast action. For Dark Souls fans, I have a feeling that you'll enjoy Bloodborne the most since the game is modeled right after a Dark Souls game in a very good way. Final Rating: 90% - If you own a PS4, you owe it to yourself to give Bloodborne a try.